Richard (Rick) Agnew is a partner in the firm's Public Policy practice and currently serves as Chairman of Van Ness Feldman. 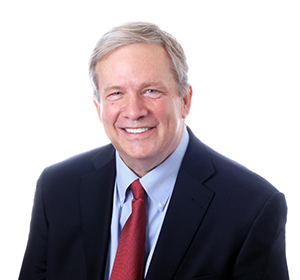 In his legal practice, Rick represents a variety of clients before Congress and federal agencies, particularly on matters relating to federal laws and permits governing energy projects, environmental matters, and the uses of natural resources. As Chief Republican Counsel for the Committee on Interior and Insular Affairs (now the Committee on Natural Resources) of the U.S. House of Representatives, Rick served as committee counsel and staff supervisor in a wide array of federal issues, involving natural resources, Native Americans, and energy production and use. He also was involved in the effort to revitalize Pennsylvania Avenue and Union Station in Washington, DC. Today, Rick uses that experience to help firm clients secure funding or permit authorizations for energy and transportation projects as well as the redevelopment of communities after significant natural disasters or other economic loss. Rick is active in Bar Association Continuing Legal Education activities and is a frequent speaker on natural resource, Native American, and electric policy issues. Rick also serves as Chair of the firm's Executive Committee. Named Best Lawyers' "2014 Lawyer of the Year"
Counseling several Pacific Northwest public utilities on hydroelectricity relicensing proceedings, including state certification under Section 401 of the Clean Water Act. Securing funding for initial studies for a municipal wastewater treatment facility in northwest Washington state. Providing counsel to a corporation seeking to provide transportation access to a proposed economic redevelopment project for areas damaged in the 1993 Mississippi River floods. Providing counsel to a large group of utility customers of the Bonneville Power Administration in major litigation involving federal Power Marketing Administration costs related to compliance with the Endangered Species Act (ESA) to ensure accountability and effective salmon recovery use under the Act. Counseling a major hydroelectricity generating utility seeking permit authority under Section 10 (Habitat Conservation Plans) of the ESA. Successfully forming a four-state legislative initiative to establish and secure funds for the coastal Pacific salmonid initiative, resulting in $600 million over the past seven years. Representing an agricultural trade association on various natural resource matters before Congress and federal agencies. Counseling an Alaska Native Corporation on major oil and gas development and land exchanges with the U.S. Fish and Wildlife Service to allow full economic use of Native lands. Providing counsel to major cruise ship operators regarding National Park Service concession contracts and entry permits into Glacier Bay National Park. Recently assisting in securing nearly $10 million in federal funding for a community in Washington state, to redevelop and revitalize a now closed pulp mill site for economic development purposes. Presenter, "The Trump Administration, New Congress and Energy"
Presenter, "Columbia River Treaty Roundtable"